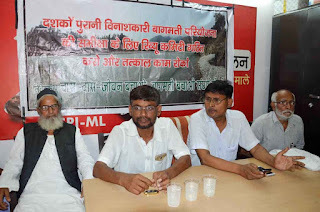 Patna: Chas Bas Jivan Bacaho Bagmati Sangharsh Morcha welcomed the state government decision for setting up a review committee on the construction of Bagmati river embankments project. The Sangharsh Morcha has been protesting since long demanding scrapping of the project. The morcha convener Jitendra Yadav, CPI-ML (Liberation) polit bureau member Dhirendra Jha and water activist Ranjiv Kumar said the project, which was conceived with the Koshi river project in the 50s, had become outdated as the river had witnessed several geomorphological changes since then. "It will be a wise step for the government to scrape the project as in the area of the Muzaffarpur district where the embankments were to be constructed, Bagmati is a cluster of river and a little bit flood in the river is helpful for farmers", they said. They demanded to include local people in the review committee. 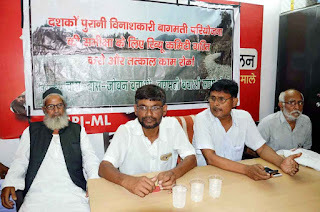 They also demanded the release of activists Mukesh Kumar and Bale Rai, who have been languishing in the jail for staging agitation against the construction of Bagmati embankments.